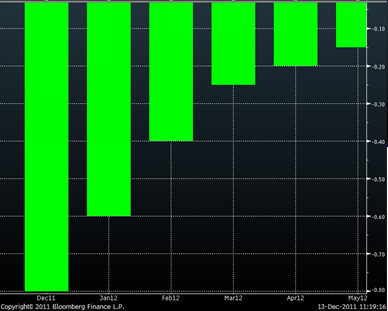 Implied volatility continues to sell off, with VIX down 10% (of vol, not points) month to date. The sell-off is particularly strong for short-dated options as VIX futures curve continues to steepen. The chart below shows VIX futures one-day move along the curve, with the nearby contract coming off sharply. With bullish year-end calls, we continue to have a case of "cognitive dissonance" as risk indicators diverge. 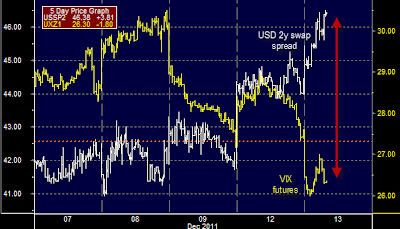 Surprisingly this time we are seeing the decoupling of the USD swap spreads and the US implied volatility index. 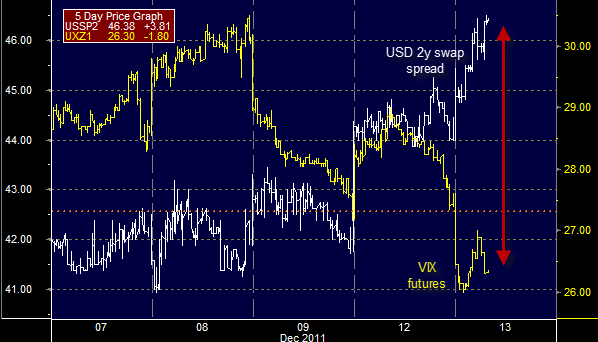 The two-year USD swap spread is up 4 bp today, while VIX is down some 3%. This indicates further decoupling of short term risks in equities from medium term bank funding risks. Given that funding risk is generally associated with banks, this divergence is also visible in the underperformance of the financial sector during the past week. The chart below compares recent performance of XLF and SPY ETFs (financial sector vs. the overall market). The broad interpretation here would be that Europe's problems may impact US financials, but in the short-term the US equity market risks have diminished. Again if one disagrees with this fundamental view, this may be a good opportunity to put on a trade: for example long SPY puts, receive fixed on the 2-year USD swap, and short 2-year treasuries.